Clam digging is one of Oregon’s most popular outdoor activities. It’s a family activity that can be enjoyed by all ages. All you need are adequate boots and clothing, a bucket, a clam shovel or rake, a shellfish license and a copy of the current Oregon Sport Fishing Regulations. In nearly every Oregon estuary, some species of bay clam can be found. Depending on a number of factors, the abundances and variety of species are different for each bay. Before clamming, harvesters should be aware of weather, tides, regulations, closures and responsible harvest techniques. 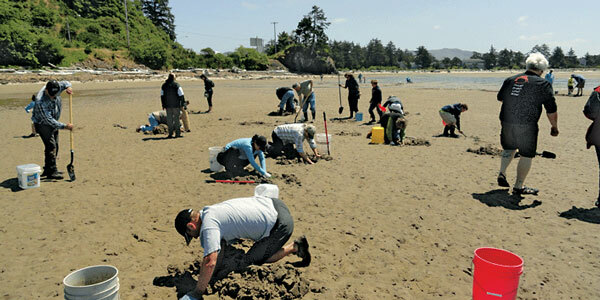 When digging for clams in Oregon, even in the summer months, sudden changes in weather should be expected. Knee-high boots are suitable for walking the beaches, but you may find that hip boots or chest waders are better for kneeling down to retrieve your clams in the muddy tidal area. Clam digging is most productive between the hour before and after low tide when more of the tideflat is exposed. Tide tables may be obtained at many local sporting goods stores. Current shellfish safety closures can be checked by calling the shellfish harvest hotline at 503-986-4728 or 800-448-2474. Clam digging ethics are an essential component of clamming. Minimize the effect of your visit into the intertidal zone. Take only enough clams to satisfy of your immediate needs. A shellfish license is required for people 14 and older. Clams may be taken by hand or hand-powered tools. Clams may not be removed from the shell before leaving the digging area. Each digger must have their own container, dig their own clams and may not possess more than one limit of clams while in their digging area. Clam confusion? Knowing your clam ”shows” (the hole they leave in the sand at low tide) will help assure you’re digging the species of clam intended. Experience in an area and with each species is the best way to decipher the differences between shows. Minimize your impact – leave the garden shovel at home. Use a shovel with a small blade such as a floral shovel or razor clam shovel. Use the blade of the shovel to dig a hole only large enough to remove the clam. Respect the resource by retaining the clams you’ve dug. Dig your own clams. It is illegal to assist others to dig clams. Remember that conservation is the key to future clam-digging. Eelgrass beds are an essential component of the marine environment and provides essential habitat for numerous fish and invertebrates. Try to leave the eelgrass beds as you found them: intact. Avoiding eelgrass is fairly easy as it tends to be patchy within clam beds. Eelgrass beds usually have breaks where digging is easiest and best. Digging clams can often require the movement of a significant amount of substrate. When piled up mud and sand can hinder the access to the surface of other clams suffocating as many or more clams than were harvested. Simply pushing the material back in the hole eases the impact on the clam bed for your next trip.